The University’s Rector is elected from among the full Professors serving at the same University. In accordance with Greek law, in order to carry out his or her responsibilities, the Rector appoints full Professors or Associate Professors serving in the Institution as Deputy Rectors and delegates specific responsibilities to them. The decision appointing the Deputy Rectors specifies the order in which they act in place of the Rector in case he or she is absent or unable for any reason to carry out the duties of the Rector. 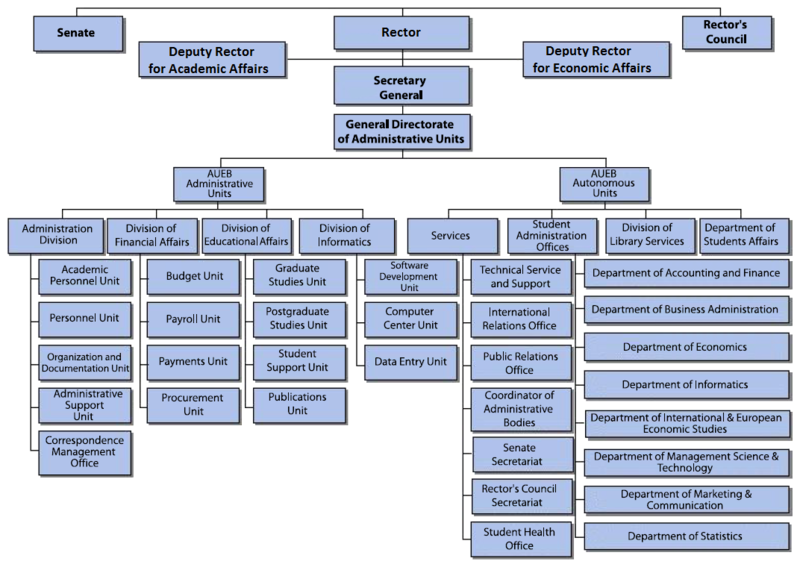 The number of Deputy Rectors is determined by the Institution’s Regulations and Procedures. (d) Student representatives, whose number is equal to 10% of the total number of Senate members in categories (a)–(c) above. If, on the basis of the above, a decimal number is obtained, then the number is rounded down to the closest integer when the decimal part is less than half (0.5) and rounded up to the next highest integer when the decimal part is half (0.5) or greater. The minimum number of student representatives is at least one representative of undergraduate students, and at least one representative in total of the categories of master’s students and doctoral students, when they exist. The abovementioned student representatives are elected, together with their alternates, for a one-year term, by the students who have the right to participate in their election, by direct, secret and universal vote of all the students in the relevant category at the Institution. (e) Three representatives, one each from the University’s staff categories of Special Teaching Staff, Laboratory Teaching Staff, and Special Technical Laboratory Staff. (f) One representative of the Administrative Staff of the Institution. The representatives in categories (e) and (f) above are elected, together with their alternates, by direct, secret and universal vote of the members of that specific category of personnel in the Institution. The representatives are elected through a unified ballot for each category of personnel, for a two-year term, and can be re-elected for one additional term. The Senate is legally constituted and operates legally, even if the student representatives and the representatives of the Special Teaching Staff, Laboratory Teaching Staff, Special Technical Laboratory Staff and Administrative Staff have not been elected. At meetings of the Senate, representatives of the Unions of the University’s Teaching and Research Staff, Special Teaching Staff, Laboratory Teaching Staff, and Special Technical Laboratory Staff, as well as other persons or bodies, may be invited and may appear, without the right to vote, when this is deemed necessary in order to provide information to the Senate. The Deputy Rectors are present at meetings of the Senate, without the right to vote. The University is composed of Schools, which are its basic academic divisions. A School covers a field of related scientific disciplines and ensures an interdisciplinary approach, communication between these disciplines and the coordination needed for their teaching and research. The School oversees and coordinates the operation of the Departments, in accordance with their Studies Regulations. The Department comprises the basic educational and academic unit of the Institution and promotes science, technology or the arts in the relevant scientific field. It organizes the Department’s teaching within the framework of its curriculum and ensures the continuous improvement in learning within it. The Department is made up of all the Professors, Lecturers and members of the Special Teaching Staff, the Laboratory Teaching Staff, and the Special Technical Laboratory Staff who serve in it. Members of the Teaching and Research Staff, who are divided into full Professors, Associate Professors, Assistant Professors and Lecturers. The Special Technical Laboratory Staff.